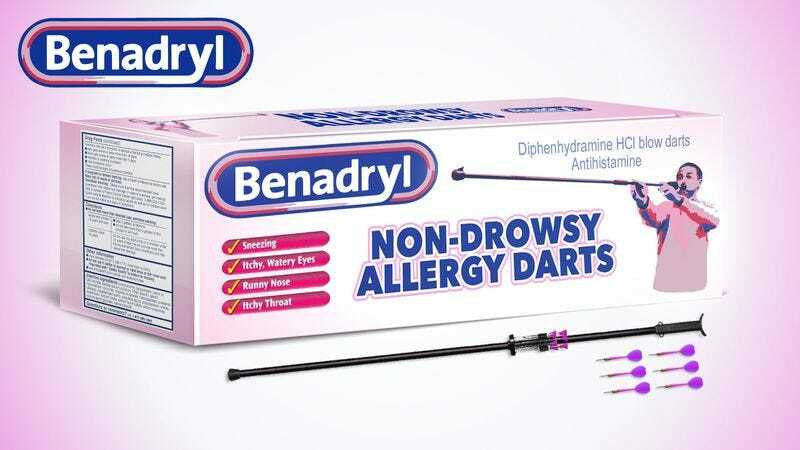 NEW BRUNSWICK, NJ—Promising consumers rapid relief from seasonal allergies without any drowsiness, Johnson & Johnson announced the release Friday of Benadryl Pierce, a new blowgun-administered antihistamine dart that will soon be available in drugstores nationwide. “This fast-acting projectile medicine combines the proven effectiveness of Benadryl with the deep-penetrating power of needle-sharp tungsten,” said company representative Charles Resnick, demonstrating to reporters how a discreet individual can crouch behind a sofa or other makeshift blind, wait for an allergy sufferer to pass by, and then fire the antihistamine-tipped dart at the afflicted person’s shoulder, neck, or thigh. “Benadryl Pierce provides your unsuspecting family members with much-needed symptom relief from distances of up to 30 yards. And unlike crossbow-launched Zyrtec, it’s available without a prescription.” Resnick added that Benadryl Pierce is also available in children’s and infant-size darts.